This is a traditional recipe for a popular Mexican side. Pico De Gallo might also be known as ‘chunky salsa’. It simply consists of fresh tomatoes, onion, jalapeno peppers and cilantro, dressed with lime juice, salt, and garlic (if desired). When I made quesadillas the other day, I absolutely had to whip up a fresh bowl of this. It completed the meal perfectly. I think you will agree! A traditional Mexican side of fresh tomatoes, onions, jalapenos, and cilantro. 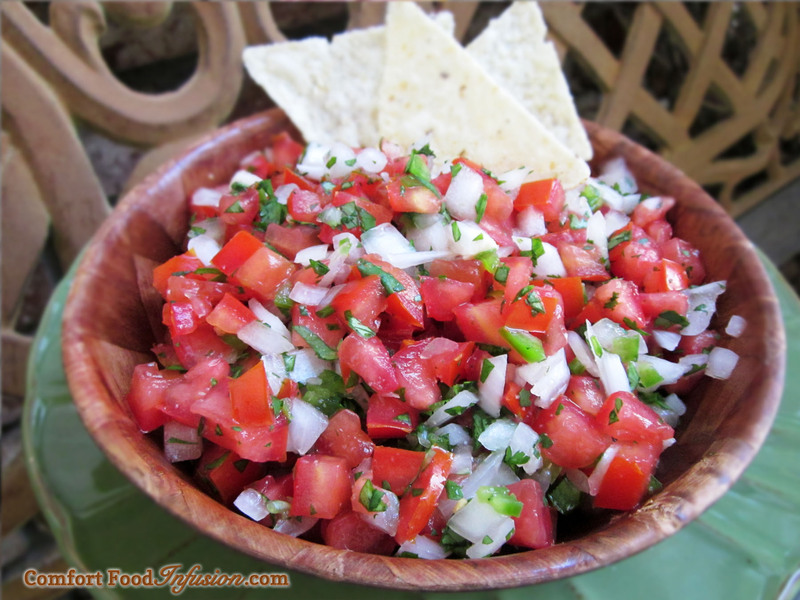 Also known as 'chunky salsa"
Quarter tomatoes and remove seeds. Chop the seeded tomatoes, onion, jalapeno (diced small), and cilantro. Place all in a medium bowl. Add, lime juice, salt, and fresh or powdered garlic (if using). Stir and let sit for about an hour to marinate. Serve with tortilla chips, quesadillas, or anything else!